Can You Decide When to Get Sick-and When Not to? by Blair Justice, Ph.D. Some people believe that by talking to their bodies they can keep from getting sick until a more convenient time. A sense of control…seems a central key to whether the effects of stress on the body are good or bad. The Prostate Puzzle, by Eva Urbaniak, N.D.
Naturopathic solutions for men’s health, combining specific herbs with nutrients that support healing of the prostate has been very effective in over 85 percent of cases. Why Essential Fatty Acids Are Necessary, by Pam Rotella. Essential fatty acids, or “good fats”, now widely recognized as essential to good health. She relates that most Americans are deficient in important fatty acids due to over processing and poor dietary practices. 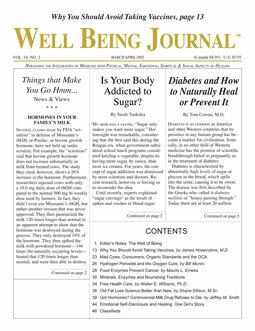 Wellness Emerging, by Scott Miners, Editor. We seem to be a part of a grand movement toward total health, as never seen before in recorded history. Gerson Therapy for Prostate Cancer. Love the Skin You’re In, by Michelle schoffro Cook, D.N.M, D.Ac., C.N.C. The Rise of Integrative Medicine, by Elizabeth Casey. Things may look a little different for alternative medicine with the next generation of health care providers. A new survey shoes that Americans age 50 or older are large consumers of natural health services and products. The Double Danger of High Fructose Corn Syrup, by Bill Sanda, B.S, M.B.A. Among other consequences of high fructose corn syrup implicated in elevated blood cholesterol levels and the creation of blood clots. The Difference Between Refined and Unrefined Salt, by David Brownstein, M.D. Salt is salt, right? Of course not. Unrefined sea salt contains over 80 minerals and elements. Refined salt contains only sodium and chloride. Intuitive Medicine: Healing and Alignment. One of a series of interviews with Shannon McRae, Ph.D. who says that our thoughts and emotions are so powerful that it behooves us to monitor where they take us, and consider how they affect our well being. A Healing Journey through Cancer, by Rebecca Istvanko, M.T. (ASCP). In 2001, she was 45 years old, newly wed, and given a prognosis of 6 months to 3 years to live, with invasive surgery. She found another way through alternative medicine, and wrote this article well into 2007. Full Responsibility: A Cancer Healing Story, by Elizabeth Hepburn. In the 1970s, four years into a bout with cancer, Hepburn took responsibility for her own well-being and sought a spiritual teacher and healer. Dietary Options for Autistic Children, by Jane Hersey. Autism affects about one in 150 children in the U.S. Many parents have reported their children’s autistic symptoms improved after going on the Feingold diet. Chicory, often used as a coffee substitute is also used as a potherb and salad and can be useful in a number of ways.